The starter set is based around giving you enough content to run a 30 Point Game, which the Rulebook defines as a Small Size Game. Don't let the name fool you. Just because it's a Small Size, and this is a Starter Set, doesn't mean you aren't going to have a number of list-building options right out of the gate. Even just utilizing the components within, you're going to have a lot of choices to make when it comes to what you field! In total you're going to have 22 points of Combat Units. With the Lannisters, you're going to want to take all four units in the box each game. Your options, however, are going to come in the form of a mixture of NCUs and Attachments. So, taking all these components as a whole, we have a number of potential lists we can make. We haven't even touched on simply swapping out your Commander here, either. While that's a super easy option when it comes to drastically changing how your army plays, today we want to focus on actual construction changes to experiment with. This is perhaps the most basic setup to run right out of the gate. You can play it with either Commander option and they both benefit equally well from it. What this Setup is going to allow is a very strong control element when it comes to the Tactics Board, as well as manipulating enemy Morale and Tactics Card usage. With this list, you are giving up a bit of field-presence in favor of control, so do take note of that. Your Combat Units are plain here with no Attachments (outside your Commander) to speak of. You're going to have to make up for that lack of presence with ruthless utilization of the Tactics Board and the combined effects of Cersei modifying enemy Morale and Tyrion granting you additional Tactics Cards while simultaneously denying them from your opponent. Here, you're going to need to use your wits, proper planning, and natural Lannister cunning to win the day. If those sound likes areas you excell at, then this is a great starter list to explore. This is perhaps the most aggressive Lannister list you can run right out of the starter, with an extreme focus on dealing damage and just annihilating your foe. With this list, you've given up the added bonus of taking a second NCU in favor of decking out your Combat Units with a variety of Attachments. The first Guardsmen unit has a Captain attached (a fairly common set-up) which allows them a guaranteed trigger to their Lannister Supremacy ability. You can stack this with Cersai as you see fit. Next, you have Gregor in the second unit of Guardsmen, which makes the usually lackluster combat prowess of the unit jump way up since Gregor just deals D3 auto-wounds each time you attack. More importantly, he grants the unit the House Clegane Affiliation, which means they gain added benefits from his Tactics Cards. Jaime, meanwhile, leads the Halberdier unit and, due to his Boldness and Courage Ability, makes it so they will never roll less than 7 dice until they are completely wiped out! Finally, we have the Mountain's Men being led by an Assault Veteran, who allows them to become a truly scary anvil unit once they become entrenched in combat, making their attacks hit on a 2+ with an added two dice! Being that they naturally have Critical Blow and Vicious, you can see how scary that can become! With this list, you do gain the additional benefit of being able to just swap out your NCU choice freely, depending on your style. Cersei synergizes well with Lannister Supremacy, the Panic that Gregor's Charges cause, and the Vicious trait of the Mountain's Mens attacks. If you prefer a little added control, however, feel free to swap her out for Tyrion to grant you additional Tactics Card options. 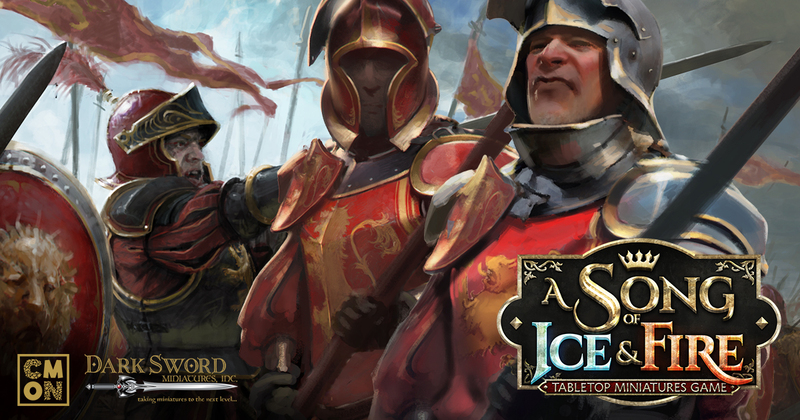 This list capitalizes on Jaime's Tactics Cards, which are all about punishing your opponent for attacking you. His unit of Guardsmen become one of the most incredibly annoying and dangerous units in the game to attack, and any savvy opponent is going to avoid them instead of directly engaging them. The second unit is going to seem very odd at first glance, as you’re sticking the Mountain in with Guardsmen, who are not necessarily the greatest in combat. The thing is… it’s the Mountain. By adding him to the unit, you've created a Combat Unit with a 3+ Defense Save that causes Panic Tests when attacked, an 8/7/5 Attack Die profile, and Sundering on top of all that. That's really scary, even with just a 4+ to Hit. It really does speak to how adding the Mountain to a unit can jump their combat potential way up. Here, we've added him to the Guardsmen because of their low cost-investment and the 3+ Defense Save allows them to stick around longer. The 2+ dice are alright on the Halberdiers, but the Sundering would be wasted, so they're not the best option. Alternatively, you could stick The Mountain in the unit of Mountain's Men as well to just make them go full berserker-style offense, cranking their already high-combat-potential to 11, allowing them to have a 10/8/6, 3+ to Hit, Attack with Critical Blow, Sundering, and Vicious. That's a crazy amount of damage coming out of a unit! It's a personal preference, but if you want to field what is potentially the single scariest Combat Unit in the entire starter, then you have your option! Finally, your NCU option here is Tyrion. While, again, you could switch out for Cersai, Jaime particularly loves the tricks his Tactics Cards employ, and having access to more of them at any single time is something to value much higher in this list than the Panic-inducing effects that Cersai brings.